A load cell is a transducer which converts force into a measurable electrical output. Although there are many varieties of load cells, strain gage based load cells are the most commonly used type. Except for certain laboratories where precision mechanical balances are still used, strain gage load cells dominate the weighing industry. Pneumatic load cells are sometimes used where intrinsic safety and hygiene are desired, and hydraulic load cells are considered in remote locations, as they do not require a power supply. Strain gage load cells offer accuracies from within 0.03% to 0.25% full scale and are suitable for almost all industrial applications. OMEGA Engineering offers a wide range of load cell in Singapore. Before strain gage-based load cells became the method of choice for industrial weighing applications, mechanical lever scales were widely used. Mechanical scales can weigh everything from pills to railroad cars and can do so accurately and reliably if they are properly calibrated and maintained. The method of operation can involve either the use of a weight balancing mechanism or the detection of the force developed by mechanical levers. The earliest, pre-strain gage force sensors included hydraulic and pneumatic designs. In 1843, English physicist Sir Charles Wheatstone devised a bridge circuit that could measure electrical resistances. 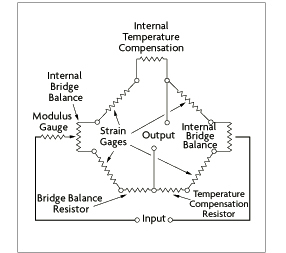 The Wheatstone bridge circuit is ideal for measuring the resistance changes that occur in strain gages. Although the first bonded resistance wire strain gage was developed in the 1940s, it was not until modern electronics caught up that the new technology became technically and economically feasible. Since that time, however, strain gages have proliferated both as mechanical scale components and in stand-alone load cells. Hydraulic load cells are force -balance devices, measuring weight as a change in pressure of the internal filling fluid. In a rolling diaphragm type hydraulic load cell, a load or force acting on a loading head is transferred to a piston that in turn compresses a filling fluid confined within an elastomeric diaphragm chamber. As force increases, the pressure of the hydraulic fluid rises. This pressure can be locally indicated or transmitted for remote indication or control. Output is linear and relatively unaffected by the amount of the filling fluid or by its temperature. If the load cells have been properly installed and calibrated, accuracy can be within 0.25% full scale or better, acceptable for most process weighing applications. Because this sensor has no electric components, it is ideal for use in hazardous areas. Typical hydraulic load cell applications include tank, bin, and hopper weighing. For maximum accuracy, the weight of the tank should be obtained by locating one load cell at each point of support and summing their outputs. Pneumatic load cells also operate on the force-balance principle. These devices use multiple dampener chambers to provide higher accuracy than can a hydraulic device. In some designs, the first dampener chamber is used as a tare weight chamber. Pneumatic load cells are often used to measure relatively small weights in industries where cleanliness and safety are of prime concern. The advantages of this type of load cell include their being inherently explosion proof and insensitive to temperature variations. Additionally, they contain no fluids that might contaminate the process if the diaphragm ruptures. Disadvantages include relatively slow speed of response and the need for clean, dry, regulated air or nitrogen. Strain-gage load cells convert the load acting on them into electrical signals. The gauges themselves are bonded onto a beam or structural member that deforms when weight is applied. In most cases, four strain gages are used to obtain maximum sensitivity and temperature compensation. Two of the gauges are usually in tension, and two in compression, and are wired with compensation adjustments as shown in Figure 7-2. When weight is applied, the strain changes the electrical resistance of the gauges in proportion to the load. Other load cells are fading into obscurity, as strain gage load cells continue to increase their accuracy and lower their unit costs. A compression load cells will often have an integral button design. They are ideal for mounting where space is restricted. They offer excellent long term stability. Compression/tension load cells can be used for applications where the load may go from tension to compression and vice versa. They are ideal for space restricted environments. Threaded ends facilitate easy installation. A S-Beam load cell get its name from its S shape. S-Beam load cells can provide an output if under tension or compression. Applications include tank level, hoppers and truck scales. They provide superior side load rejection. A Bending beam load cell can be used in multiple load cell applications, tank weighing and industrial process control. It features low profile construction for integration into restricted areas. Platform and single point load cells are used to commercial and industrial weighing systems. They provide accurate readings regardless of the position of the load on the platform. Canister load cells are used for single and multi-weighing applications. Many feature an all stainless steel design and are hermetically sealed for washdown and wet areas. Low profile load cells are basically compression and tension/compression load cells. Mounting holes and female threads provide easy installation. Used frequently in weighing research and in-line force monitoring. Hydraulic Load Cells Up to 10,000,000 lb 0.25% Tanks, bins and hoppers. insensitive to temperature. Expensive, complex. Pneumatic Load Cells Wide High Food industry, hazardous areas Intrinsically safe. Contains no fluids. Slow response.